First, let's create an empty application. 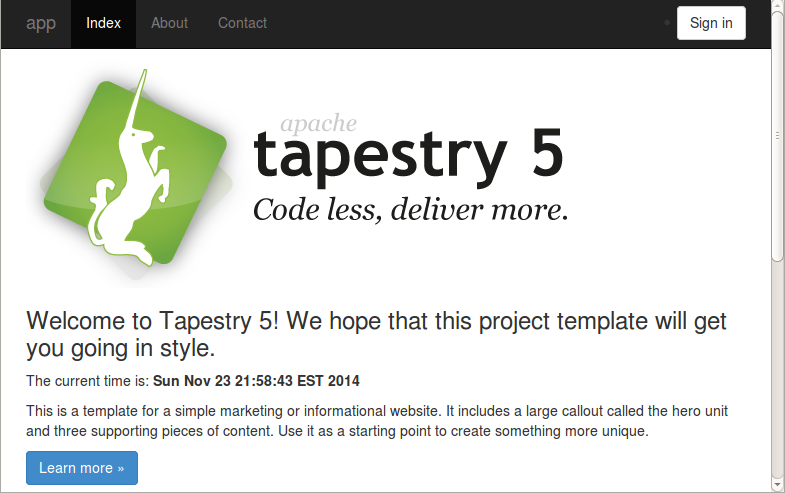 Tapestry provides a Maven archetype (a project template) to make this easy. 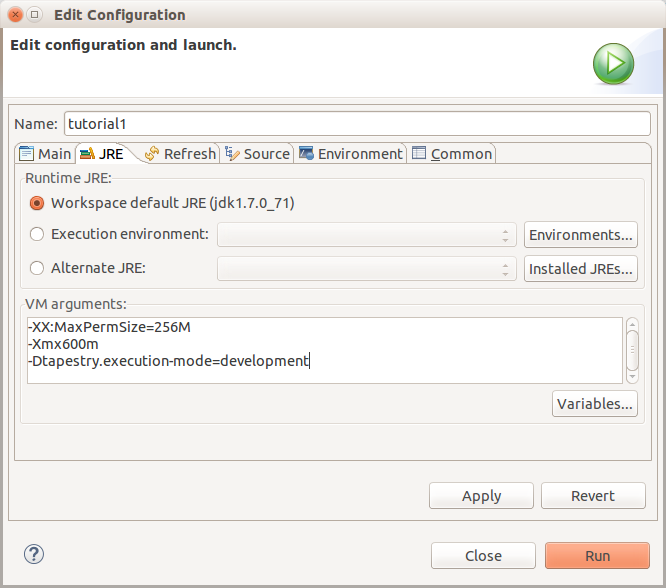 For the tutorial, we're using a fresh install of Eclipse and an empty workspace at /users/joeuser/workspace. You may need to adjust a few things for other operating systems or local paths. 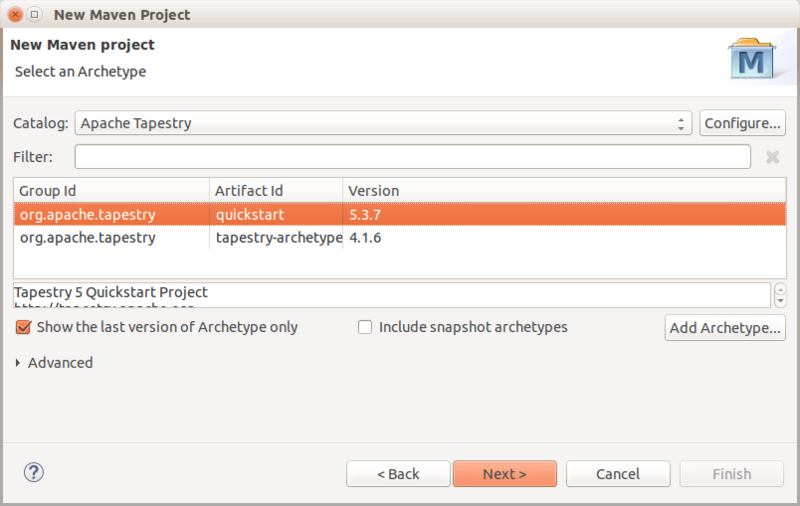 From Eclipse, we'll use a Maven archetype to create a skeleton Tapestry project. If you are behind a firewall/proxy, before performing any Maven downloads, you may need to configure your proxy settings in your Maven settings.xml file (typically in the .m2 subdirectory of your home directory, ~/.m2 or C:\users\joeuser\.m2). Here is an example (but check with your network administrator for the names and numbers you should use here). Of course, adjust the localRepository element to match the correct path for your computer. Okay, let's get started creating our new project. 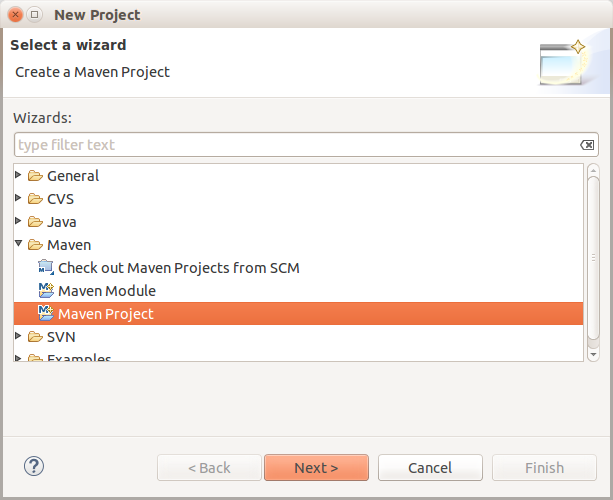 The instructions below use Eclipse's New Project wizard to create the project from a Maven archetype. If you'd rather use the mvn command line, see the Getting Started instructions, then skip to Creating The Skeleton Application page. As shown above, enter "http://tapestry.apache.org" in the Catalog File field, and "Apache Tapestry" in the Description field. If you want to try an unreleased (alpha or beta) version of Tapestry, use the https://repository.apache.org/content/repositories/staging archetype catalog file instead. 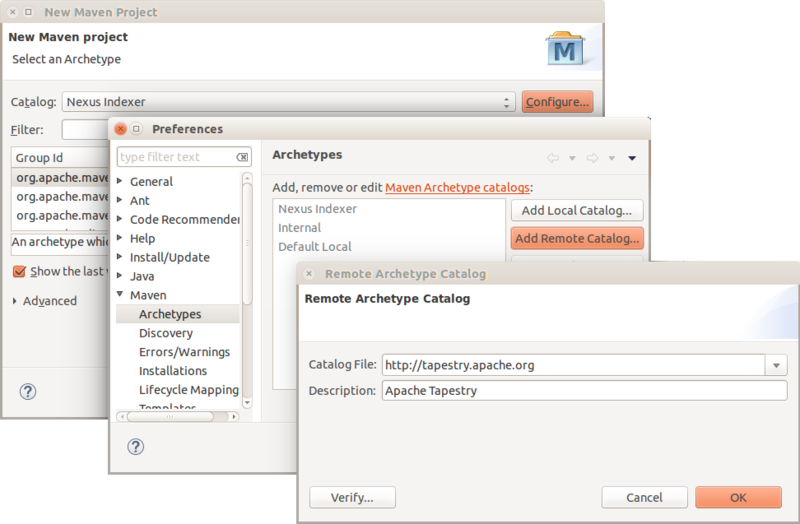 On the Select an Archetype dialog (shown below), select the newly-added Apache Tapestry catalog, then select the "quickstart" artifact from the list and click Next. Note: Screenshots in this tutorial may show different (either newer or older) versions of Tapestry than you may see. The first time you use Maven, project creation may take a while as Maven downloads a large number of JAR dependencies for Maven, Jetty and Tapestry. These downloaded files are cached locally and will not need to be downloaded again, but you do have to be patient on first use. 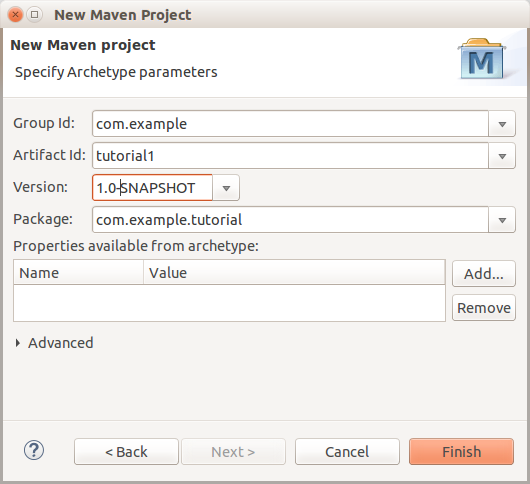 After Maven finishes, you'll see a new directory, tutorial1, in your Package Explorer view in Eclipse. 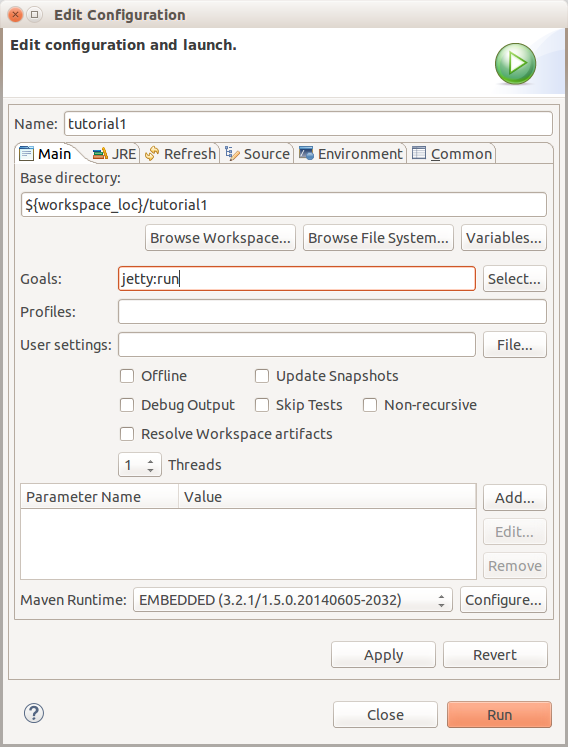 One of the first things you can do is use Maven to run Jetty directly. Again, the first time, there's a dizzying number of downloads, but before you know it, the Jetty servlet container is up and running. Note the red square icon above. Later on you'll use that icon to stop Jetty before restarting the app. NOTE: Your screen may look very different depending on the version of Tapestry you are using! The date and time in the middle of the page shows that this is a live application.